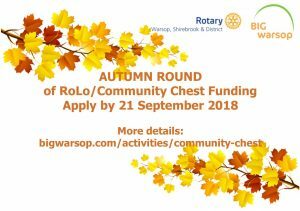 The latest round of funding from the RoLo/Big Warsop Community Chest is now open for applications. Applicants have the opportunity to apply for up to £500 of funding for their community project, group or organisation. – be working towards a constitution. You can download an application form here or email office@bigwarsop.com. The deadline for applications is Friday 21 September.